A: Clear, light amber color with one finger of off-white foam head that collapses to a dense, continuous residue. Heavy lacing remains on the glass. S: Prominent husky grain makes for a malt-forward smell, with accents of fruity esters and floral hops. T: Begins with dry, bready malt that soon turns sweet as full, earthy caramel emerges and extends into the middle. Fruit also comes out in the middle, tasting of lychee, currant, and blackberry. The drying finish retains the earthy and fruity qualities, while also developing moderate bitterness and bright appealing acidity. Sharp mineral and an occasional whiff of citrus rind linger on the palate. M: Thin to medium viscosity, wet and refreshing on the palate, with low carbonation. D: This beer is easy to overlook, standing as it is in the shadow of some of Ballast Point's more hyped contributions. Still, it is a fine English-style pale ale with big flavors that is not out of place alongside Alesmith's Anvil ESB. 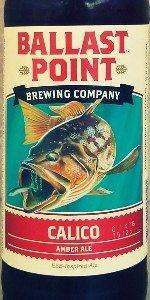 In fact, it is what many were likely expecting the first time they ordered another of Ballast Point's beers: the Yellowtail (German-style) pale ale. Pours a deep copper colour, almost with a reddish tinge to it, and a fine-bubbled head of off-white. Lacing is frothy and patch, but solid, forming around the glass in solid enough rings. Body has some heft to it, rather pleasantly, and the carbonation is mild but extremely fine. Looks good. Nose is grainy and bright, with pleasant slightly toasted characters and a mild fruit character, perhaps just a hint of banana. Some subtle crushed greens get a look in as well. It's all quite mild, but it's pretty well integrated, and quite pleasant. Taste is a little thinner, and rather metallic, with a coppery bite towards the bit to back and a slight astringency. Graininess comes through to clean up on the back, or rather it just appears once the metallic character drops out. It's pleasant enough, and it has some character to it, which is good. Not a bad drop. Sessionable, with enough character. No, it's not the most exciting brew in the world, but it's solid. Pours a deep amber, hazy with a light cream color head. Lots of lace and huge lemon meringue pie like head initially. Head settles to a pinkie width and has a great layer left the whole drink. Great lacing and a great looking brew. Brew smells of creamy malts, bready and caramel malts. Sweet fruity hops as well. Maybe even some floral. Good nose. Brew tastes lighter than expected, good creamy malts in the back end and a nice peppery hop kick up front. Finishes and drinks balanced. A little sweet and sticky as well from the lingering hops. Caramel, biscuit, oranges, floral; lots of flavors. A great session ale here, a very good brew to have several of. Lots of flavors the appearance is top notch. Great session amber/brown here. A: Golden-copper, nice and translucent. The head flees a bit quickly, and the lacing is slightly thick. S: Sharp malt is a bit heavy here; there is a tinge of some spice that I can't quite place. Maybe hints of all-spice? T: Good hop spice with a thick malt backbone--really well balanced. It's got that bitter aftertaste that many ambers are known for. Quality. M: Nicely carbonated and prickly on the tongue, this brew still has a creamy undertone. O: This may not be my favorite from Ballast, but it's a solid offering nonetheless. This guy is actually a fairly dark amber. It could equally pass for a red ale. The head was very pretty: dense, good retention, a excellent lacing. On the nose, I couldn't get much other than yeast and malts, maybe a little orange peel? The only outstanding quality taste-wise is the hoppy/metallic finish, which plays well with the bubbly, sharp texture. Other than that, a very conservative amber ale, which for the genre, is par I guess. I enjoyed it but probably won't buy another sixer, only because I prefer the more complex Ballast Point varieties. Pours an amber like color with an off-white one finger head. Head does not last too long but does not go away quickly, its on par average. Very small amounts of lacing is left behind. Smell is that of dark fruits with the likings of purple grapes, prunes, berries, sweet caramel, bread like yeast. Smell is just wonderfully full of malt flavors. Cant wait to take a sip!!! Taste lacks what I got from the smell. Very low malt flavor giving it just a slight sweetness to it. Lacks flavor and its pretty watery. Mouthfeel is thin and watery with low carbonation. Well the smell was great but this lacked flavor to me so it was a disappointment. S - Malt, Caramel and a thin whiff of some hops. The balance of the smell is semi sweet and malty..
T - Dark roasted malt taste with a hint of caramel and semi-sweet chocolate. There is a nice finish to this beer with some hops on the back end. The finish starts chewy and finishes dry. M - A medium thickness on this beer with light carbonation and plenty of chewy sweet malt to boot. D - Great session beer that is relatively light in alcohol @ 5%. Nice interpretation of the amber beer style. Bought a 12oz'er while on vacation in Charleston at the Charleston Beer Exchange. Ultimately was poured into a regular pint glass. Appearance: Deep, clear red color with a very excited, very foamy white head that lasts forever. Once in the glass this is a very impressive looking beer. Great color on this one. Smell: Sweet aroma from the malts with some hints of honey and molasses. Little toasted aroma's come through as well, maybe some peppery spiciness also? Taste: Oily hoppiness strikes first, but its light and inviting. Bready caramel malt flavor comes through second with a light toasty flavor and slight citrusy hop flavors peeking through. Caramel sweetness and some bitterness finish it off. Mouthfeel: Lightly carbonated, more hope bitterness than I expected. Still nice though. Drinkability: Medium bodied, low ABV, a sixer would've been nice. I really enjoyed this. It won't change your life, but I think I found my new go-to Amber.